Learn touch typing online using TypingClub's free typing courses. This online program will assist you with learning and improving your typing speed. Using this program, your typing speed will reach 10 to 12 words per minute quickly. You do not need to create an account but if you do, you can save your progress. Great FREE online typing course. Student needs to “register for free” and have an email account. Progress is kept as one works through the lessons. A free internet program for learning and practicing touch-typing. The site speaks to a wide target audience and offers its unique learning method in a range of languages and in compatibility with the various types of keyboards. This site has typing practice and tests using the QWERTY and DVORAK keyboards (we use QWERTY). Includes five challenging games with multiple levels. 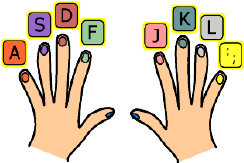 Here you'll find a set of free online typing lessons and typing exercises for beginning typists who want to move from four-finger typing to full-blown touch typing. Exciting free typing games and keyboarding games to play online. ​Keyboarding is a motor skill. It is a matter of training fingers to respond correctly and quickly to press the correct key -- kind of like in athletics where you keep doing it over and over again until it becomes habit. Touch-Typing: Is it Worth it? What is the Safest Way to Type?